We have transitioned from the warmth and busyness of summer to the fall routines of school and harvest. I am enjoying the crisp mornings and the orange and red palette spreading through the trees. And, of course, I am looking forward to October, the month of fiber revelry! So many events and opportunities to connect with fiber and fiber fanatics! At WEBS, we kick off the month with a weeklong celebration. 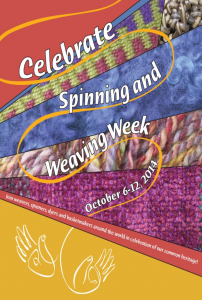 International Spinning and Weaving Week is October 6 – 12 and in our little corner of the world that means an abundance of ways to experience fiber and textiles from fleece to finished handwovens. Central to the week are daily demonstrations and workshops covering a wide range of techniques. Demonstrations are free and open to all who come in to the store. 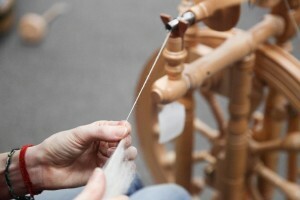 They take place from 11 am – 1 pm and will feature spinners using wheels and spindles to create yarn from fleece and roving. 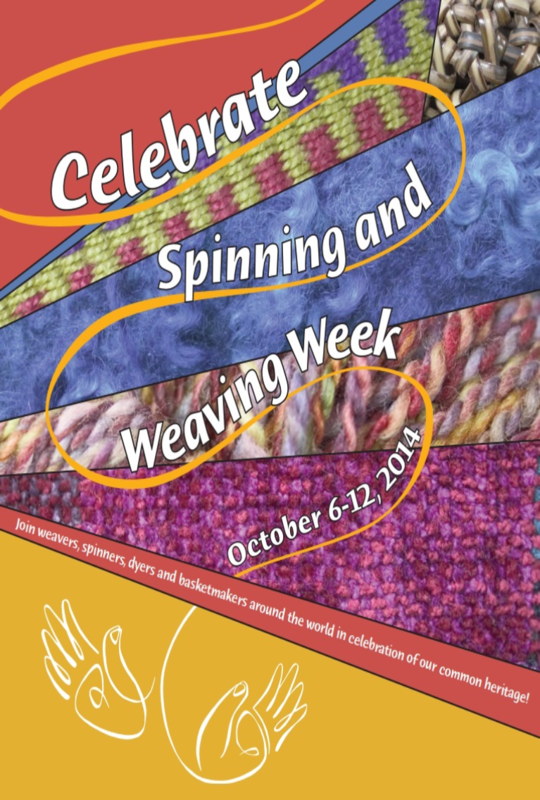 Weavers will also be showcasing their skills on a wide variety of looms. It’s a great opportunity to watch the process up close and talk with the artisans about how they create. It’s not just children who are fascinated by the rhythm (although they are welcome to check it out as well)! Mini-workshops will also be offered daily from 2 – 4 pm. These workshops offer a taste of a new technique, a chance to learn a different way to do things or maybe expose yourself to something new. The mini workshops cost $5 each and you can register online, over the phone or in the store. Two special demonstrations during the week will highlight the huge range of possible styles of weaving. On Tuesday from 12 – 1 pm, Weaving Manager Leslie Ann Bestor will demonstrate weaving on a computer-assisted loom. 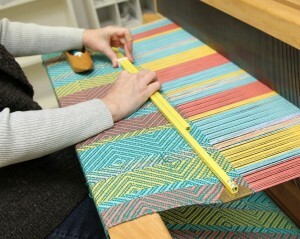 And on Friday we will showcase Saori weaving with Mihoko Wakabayashi from 11 am – 1 pm. And a WEBS celebration would not be complete without some great deals and discounts! 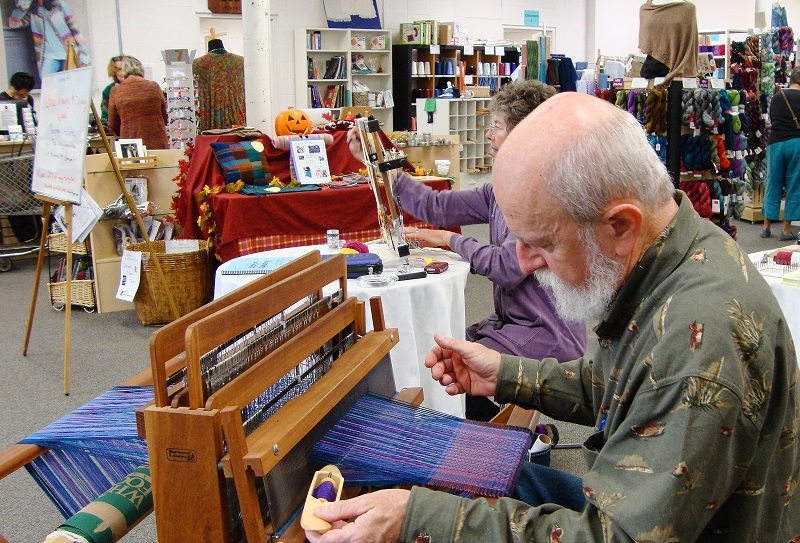 Weavers can look forward to 15% off reeds, warping mills, and Schacht Flip rigid heddle looms; 20% off all weaving DVDs and new additions to the Great Cone Sale. 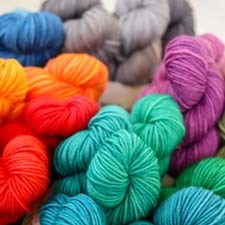 For spinners we will have 20% off all fiber, Howard hand cards, and spinning DVDs; 15% off spinning wheels and 30% off 8 ounce bags of Louet Dyed Corriedale Top. Join us to celebrate, learn and be inspired! This entry was posted on Wednesday, October 1st, 2014 at 9:00 am	and is filed under Classes, Events, Products at WEBS. You can follow any responses to this entry through the RSS 2.0 feed. You can skip to the end and leave a response. Pinging is currently not allowed.